In need of a tent? Here's a HOT deal for Amazon Prime Members! 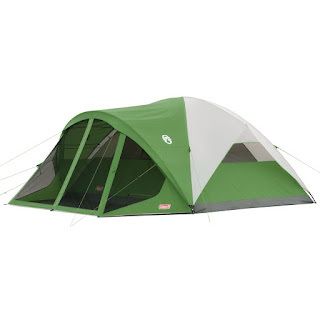 Head over today to get this Coleman Evanston Screened Tent for ONLY $86.89 (Retail $249.99) as part of the Amazon Prime Day deals! Enjoy the great outdoors without the bugs inside the Coleman Evanston 8-Person Tent with Screen Room. Great for car camping and extended camping trips, this spacious tent offers enough room for 2 queen-size airbeds and is designed to set up in under 15 minutes thanks to snag-free, continuous pole sleeves and Insta-Clip pole attachments. The tent's WeatherTec system features patented welded floors and inverted seams to keep the rain off you and your gear; a rainfly is included for extra weather protection. Extended awnings let you keep the windows open for enhanced air circulation without letting in the rain. The tent also comes with a separate screened-in room for extra ventilation, covered storage for your gear, or an extra sleeping area on warmer, dry nights. Remove the included rainfly to let in more sunlight through the mesh roof on dry days or to gaze up at the stars on dry nights. "